This is the very first photo we took. It’s the ATM at the airport, which offered us an ambiguous suggestion that cash had been dispensed, but no actual cash. I took the photo in case I had to file a future appeal. 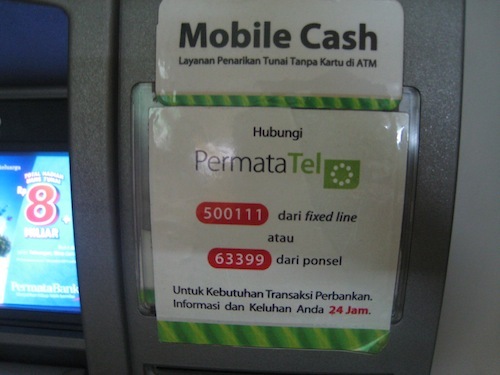 In Indonesian. Whatever! I was tired from 23-plus hours of travel! 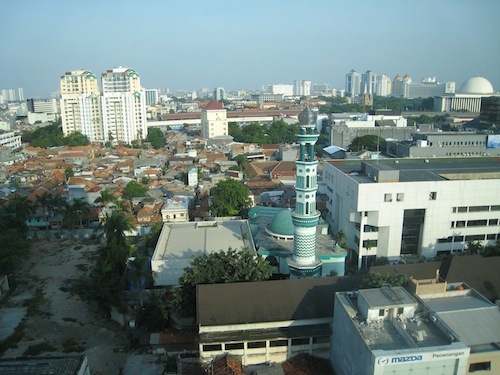 The view from our hotel window in Jakarta. Calls to prayer emanated from the mosque at 4 a.m. sharp. I was awake already – damn jetlag. Anyway, a reasonably pretty view in a not especially pretty city. At the National Museum, where random white ladies (such as these pictured) may find themselves treated as rock stars by excited throngs of Indonesian schoolgirls. 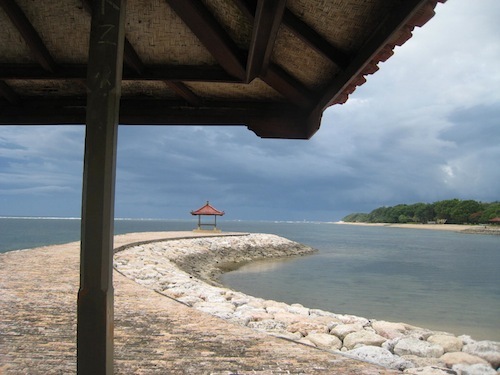 Goodbye, Jakarta, hello, Bali! No more crowded cities. Time for the kind of resort experience that costs about as much as a Howard Johnson’s here. 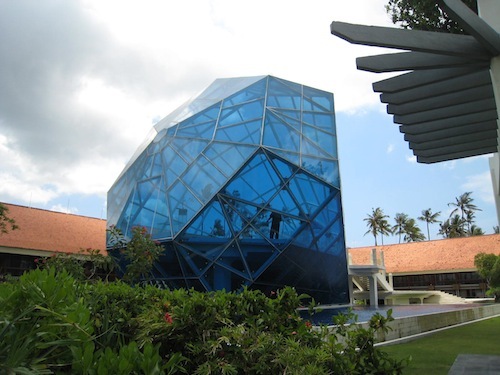 The Blue Diamond, a glass beachside structure built for weddings. 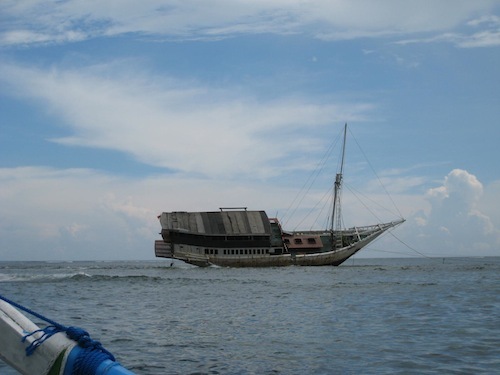 A boat stranded on the reef. So odd-looking, propped all askew almost all the way out of the water. The afternoon thunderstorm rolls in. 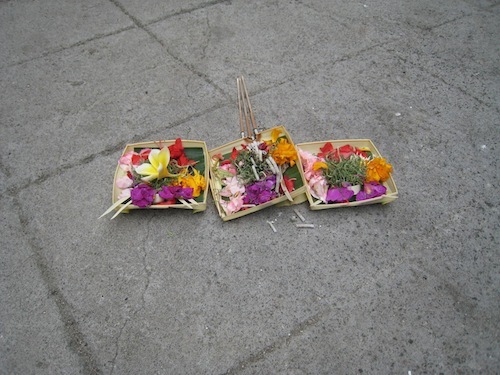 Balinese people place these small woven baskets filled with flowers and food every day outside their shops and homes as offerings. Thanksgiving, indeed. 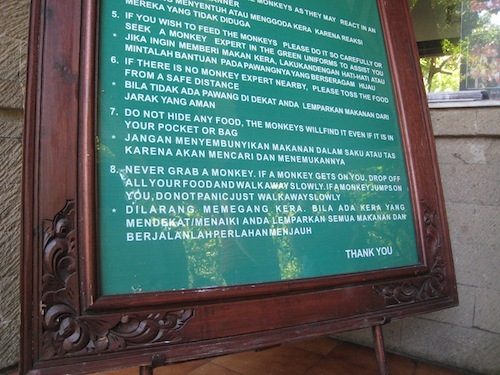 If you go to the Monkey Forest, heed the signs. Because the monkeys are not shy. Here is one charging up to try and grab the sunglasses off my head. I ducked and ran just in time. 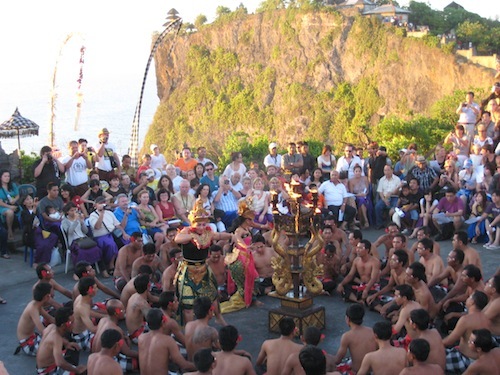 Traditional Balinese dance show at sunset, at the Ulu Watu Temple. Thanksgiving dinner. Not so traditional, but every bit as tasty. 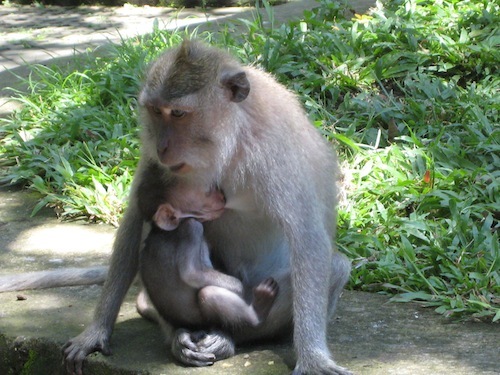 wow, neato!… 4 more bali pic posts please! Thanks for sharing all of these; I especially love the photo of the two of you surrounded by the girls. I only wish that there was mention of your lovely, matching suitcases. “Never grab a monkey” – wise words for the ages. 2: RB is recoiling in embarrassment at the mere mention of it. They were ON SALE!! 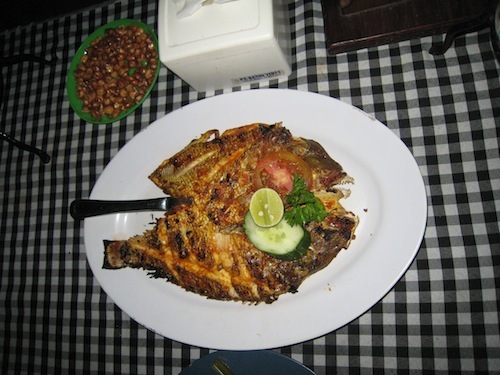 You’re looking swell, Bali, I can tell, Bali! 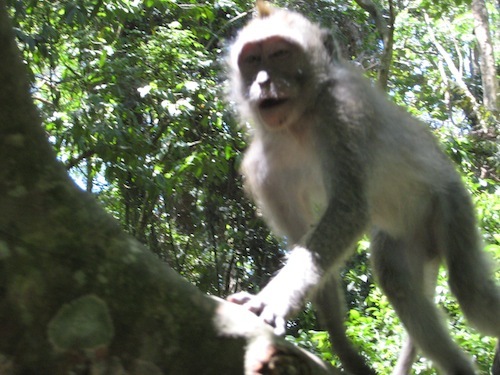 Especially in your monkey forest. I know, I know, that’s what she said. I am ravenous with envy over this trip.